Trying to make sense of all the different versions and translations of the Bible? Download The Holy Bible: A Buyer’s Guide and start receiving Bible History Daily — both absolutely free! This free eBook guides you through 33 different Bible versions and addresses their content, text, style and religious orientation. In the free eBook The Holy Bible: A Buyer’s Guide, expert Bible scholars Leonard J. Greenspoon and Harvey Minkoff answer these and other important questions about different Bible versions. How can a buyer tell when a Bible is a different translation (or version) or the same old text in a new coat? Some publishers put out several translations. Oxford, for example, prints copies of the New Revised Standard Version, the Jewish Publication Society Tanakh, the New American Bible, the New King James Version, the old King James Version and more. And several publishers put out the same translations: Eight different publishers have been given broad licenses to publish the New Revised Standard Version, for example. And sometimes publishers put out one translation under numerous different titles. Zondervan’s Devotional Bible for Dad, Revolution: The Bible for Teen Guys and True Images: The Bible for Teen Girls all contain the same translation (the New International Version—the most popular translation today) with distinctive covers on the outside and different annotations, devotional aids and interpretive materials on the inside. Some Bibles are aimed at specific religious groups, but this is not always clear from the title. How is a Bible buyer to know that the New American Bible is prepared by and for Roman Catholics, while the similarly named New American Standard Bible is aimed at conservative Protestants? Let expert Bible scholars Leonard J. Greenspoon and Harvey Minkoff guide you through the content, text, style and religious orientation of different Bible versions. The Holy Bible: A Buyer’s Guide provides straightforward, objective and succinct information on 33 Bible versions or families of versions. The updated edition of The Holy Bible: A Buyer’s Guide includes additional reviews of six Bible versions (published through 2013) by Creighton University scholar Leonard J. Greenspoon. Organized as Literal Translations, Non-Literal Translations (with Extended Vocabulary), and Non-Literal Translations (with Limited Language), these updates fit in seamlessly with the earlier format. 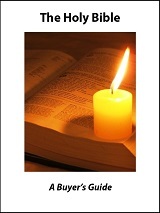 The Holy Bible: A Buyer’s Guide is far from the first such effort, nor will it be the last. What distinguishes this Bible guide from others is that it allows each Bible version to speak on its own behalf. We’ll send you a link to download your copy of The Holy Bible: A Buyer’s Guide and offer you a FREE registration to the Bible History Daily newsletter, bringing the world of the Bible and archaeology directly to your inbox. Your FREE registration to Bible History Daily introduces you to community discussions on fascinating topics like the Dead Sea Scrolls, top Biblical archaeology discoveries, ancient Israel and Easter. Having difficulty signing in for the free download. How to get forgotten password? Which Bible should we get? Which of billed should we get? I need to get the Bible translated to english from it orginal form is it possible to find? Yahshua said “I AM the Aleph and the Tau – I am referring to ancient Hebrew where the Tau is written like a Cross or an X – could you explain that please? Thank you. Jesus never said he was the Alpha and the Omega……it only has reference to God himself. Do we have evidence of when these translation errors occurred and where in the bible things are altered? As I said Emily every where that you see cross it should read stake or tree………. 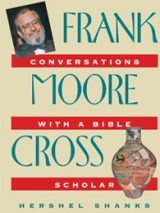 Here is another sample: In the book The Cross in Ritual, Architecture, and Art, it states: “It is strange, yet unquestionably a fact, that in ages long before the birth of Christ, and since then in lands untouched by the teaching of the Church, the Cross has been used as a sacred symbol. . . . The Greek Bacchus, the Tyrian Tammuz, the Chaldean Bel, and the Norse Odin, were all symbolised to their votaries by a cruciform device.”—By G. S. Tyack, London, 1900, p. 1. Bibles should be translated correctly from the original manuscripts, without any particular religion in mind, whether it be Catholic, Protestant, etc………after all it is God’s Word and God’s Word should be truth……..and there can only be one truth. Example: Matthew 10:29 Different versions state that two sparrows sell for a farthing, or some translate it penny……….I didn’t know the first century Jews traded with £.s.d. The actual Greek word used here was ‘assarion’ a Roman coin of small value. This was just a small example BUT there are more glaring translation errors to found when a Bible translation is altered to back up a false belief. Does this come with a study guide I can use with grandchildren?? MaraNatha. Well done, as we must allow evidence to show up the works of Scholarships!!!!! May I suggest Reader, that you also read my comments that I made to Mara, and using God’s Word please point out to me where I have erred!!! The New World Translation should be added to that table as it is more corrupt than the NIV. In fact, any translation that uses Westcott and Hort (like the NWT and the versions in the table) needs to be burned! Westcott and Hort used the Codex Vaticanus and the Codex Sinaiticus for their translation. It is all Catholic/Freemason dogma. @Kurt: The Tetragrammaton is not in the New Testament. Your translation, the NWT, has erroneously added it 237 times where it is never found. “Jehovah” is just a guess. The name is a combination of YHWH and Adonai. The five people who translated the NWT had the help of a Catholic mystic named Johannes Greber, who used necromancy for his NT translation. THAT is where your translation gets it’s influence to call Jesus “a god” in John 1:1. You obviously have not read the NWT and compared it with other translations of the Bible, all you have managed to do is to go to some web site and read what someone else has said, that , for some reason has “an axe to grind” with the NWT..
Before you start “casting stones,” may I suggest you do some personal comparisons with other Bible translations, with the assistance of some reputable Bible encyclopaedias that do push a particular belief…..e.g. Catholic Encyclopaedia. That reminds me, many years ago, I looked at the previously mentioned, and under the 10 Commandments it said………from memory……..Thou shalt not kill: except in the following circumstances (there were 6 or more circumstances), the only one I recall was if your country goes to war ……….I am sure that Jesus would have approved…..NOT. The name of God, Jehovah, in the Christian Greek Scriptures (NT) is only found where direct quotations from the Hebrew Scriptures are used. * so called Christians, not real Christians, as were the 1st century Christians. 1 + 1 + 1 = 1, when I went school it was 3.
verse 11 it says that we should acknowledge Jesus as Lord, to the glory of God. he really die? If that was so how can this be a life saving sacrifice. 6. The Bible clearly states that Jesus is the SON of God, NOT god. If I am incorrect in what I have said above please use the Bible, to prove what I have said, is wrong!!! J2 Hebrew Gospel of Matthew, incorporated as a separate chapter in ʼEʹven boʹchan [“Tried Stone”], by Shem-Tob ben Isaac Ibn Shaprut, 1385. Edition: The Gospel of Matthew According to a Primitive Hebrew Text, by George Howard, Macon, Georgia, U.S.A., 1987. J9 The Four Gospels, in Hebrew and Latin, by Giovanni Battista Jona, Rome, 1668. There are actually 73 instances mentioned – (and that is not all of them), where other Greek Scripture (NT) translations use the name Jehovah in one or several more places. Do you have any more ‘gems’ Mara……..I wait with bated breath! I almost forgot Revelation 19:1, 3, 4, 6 uses the word “Hallelujah.” which is a contraction of the phrase, ‘praise Jehovah’……..I wonder how many times you may have said or sung that word???? Interested in your reply Mara!! Jesus at John 17:6, 26 makes a definitive reference to God’s name. Does it not seem strange that when reading a Bible the names of other gods are included, but omits the name of the creator of all things, just calling him God or Lord, which are just mere titles, NOT names. Just another little gem for you Mara: Wescott and Hort were consulted by the British revision Committee, (Wescott and Hort were members). This text was also used in the translation of the Christian Greek Scriptures of the following Bibles: The Emphasised Bible, the American Standard Version, An American Translation and the Revised Standard Version. The NWT Translation Committee also used Nestle’s Greek Text, José M. Bover (1943), Augustinus Merk, (1948), the United Bible Societies text of 1975 and the Nestle-Aland text of 1979…….also used were about 30 fragments of old Latin. Versions and thousands of manuscripts of Jerome’s Latin Vulgate, as well as Coptic, Armenian and Syriac versions. Mara says: “THAT is where your translation gets it’s influence to call Jesus “a god” in John 1:1.” Interesting that you should mention John 1:1…….the catholic church teaches the trinity – correct? Interesting that in the Emphatic Diaglott, (catholic), in the word for word translation of John 1:1, it shows that the word was ‘A GOD’ – NOT God…….and in the English translated column it reverts back to the error, calling the Word God……..really clever…….NOT. You also need to get a little more up-to-date in your information Mara……..you may be quite surprised as to what you might find out!!!! I align with “Elmer” in the above comments with respect to the availability of this book in hard copy, or available on tape or CD. To download this book on my computer will take up too much space in my small computer. Thank you in the name of our saviour Jesus Christ. Sir I. Am from India and I. Am. Egarly. Waiting your publication s about Christianity to know. And understand about the value of life. My research further led me to believe that Westcott and Hort were not fit to produce their GNT. Hort himself admitted that he knew very little Greek. The clubs they belonged to and especially the RC doctrine the believed, leave a lot to be desired . Be that as it may, I will gladly download the EBook to ad to my collection. Do you have this book in hard copy rather than in ebook format? I wish you would include more if the Lost Books in your posts. I’m interested in books not permitted in the KJ, NIV, or Catholic bibles. I enjoy you articles so much. I find then well written and trustworthy. Looking forward to next issue. Thank you for all the research you put into your background work.